CharlesLamb is a Legacy Library. Legacy libraries are the personal libraries of famous readers, entered by LibraryThing members from the Legacy Libraries group. » Charles Lamb's legacy profile. 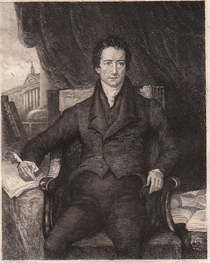 CharlesLamb is also an author. » See Charles Lamb's author page. "The history of Lamb's books is more humanly interesting than the history of the Huth or Grenville library; as chattels or furniture they were worthless; they were generally the poorest copies imaginable; but if they did not cost money, they often cost thought; they sometimes involved a sacrifice, if the price was in the high altitude of a sovereign. In the case of Lamb, the sister's opinion was sought, and the matter lay ever so long in abeyance before the final decision was taken, and Lamb hastened to the shop, uncertain if he might not be too late, if the person whom he saw emerging as he entered might not have 'his' book in his pocket. Here was payment in full for the prize; the coin handed to the vendor was nothing to it; Lamb had laid out more than the value in many a sleepless night and many an anxious calculation. Lamb, although he probably never bound a volume in his own life, or purchased one for the sake of its cover, could grow enthusiastic over his favourite Duchess of Newcastle, and declare that no casket was rich enough, no casing sufficiently durable, to honour and keep safe such a jewel (p.15)." "I looked over Lamb's library in part. He has the finest collection of shabby books I ever saw ; such a number of first-rate works in very bad condition is, I think, nowhere to be found." Mr. Lamb's taste in books is also fine and it is peculiar. It is not the worse for a little idiosyncrasy. He does not go deep into the Scotch novels, but he is at home in Smollet or Fielding. He is little read in Junius or Gibbon, but no man can give a better account of Burton's Anatomy of Melancholy or Sir Thomas Brown's Urn Burial or Fuller's Worthies or John Bunyan's Holy War. No one is more unimpressible to a specious declamation, no one relishes a recondite beauty more. His admiration of Shakespeare and Milton does not make him despise Pope and he can read Parnell with patience and Gay with delight. His taste in French and German literature is somewhat defective nor has he made much progress in the science of Political Economy or other abstruse studies though he has read vast folios of controversial divinity merely for the sake of the intricacy of style and to save himself the pain of thinking. Many of my literary friends sent copies of their works to me. I thanked them many times over in the more than 700 letters I wrote to them. Fortunately, there are those book lovers at Library Thing who are currently reading and researching my published letters, identifying the books that were once mine, and helping to create an online catalog of my library. In a way, I am communicating with them from the grave, through my letters: "My dear new Friends... I like that!" As an author, I wanted to have a copy of everything I wrote in my library. LTers have used Renee Roff's A Bibliography of the Works of Charles and Mary Lamb to catalog the books I either wrote or contributed to, identifying the pages covering each specific work. For instance, Roff, p.185-89 identifies the pages covering Last Essays of Elia. Also included in this LT catalog of my library are just a few of the periodicals I contributed to; but, mind you, I wrote numerous pieces for over 25 different periodicals. I simply didn't have the room in my library to keep every issue which contained one of my pieces! Yes. I had many books in my library. When I died, I bequeathed them all to my friend, Edward Moxon, the publisher; however, he kept the books with my sister, and didn't take possession of them until she died thirteen years later. By that time, the condition of many of my books had deteriorated. Some of my books had even walked out the door under the arms of some of my friends, and, I suspect, under the arms of some people I didn't even know. Of the remaining books, Edward Moxon saved sixty of the best of my books, and sent them to America for sale. He reportedly destroyed all the other books; however, that is not the case. In his book, "The Lambs: Their Lives, Their Friends, and Their Correspondence," W. Carew Hazlitt lists some books of mine which were not destroyed. Some people were angry with Edward Moxon for destroying some of my books. In all fairness to him, my sister and I were the ones who destroyed my books. We cut engravings out of my books and pasted them on the wall. The sixty books chosen by Moxon were brought to the United States by Charles Welford in 1848, and individually sold at the store of Bartlett & Wellford in the Astor House in New York, and then gathered up and resold at auction. The list of books was first published in The Literary World in 1848. The Dibdin Club published "A Descriptive Catalogue of the Library of Charles Lamb" in 1897. Edward V. Lucas compiled the most complete list of the books in my library in an appendix to his 1906 book Life of Charles Lamb. Books identified from this source are referred to as "from the Lucas List." Lucas identified several authors whose books he believed were in my library without identifying the titles of their books. The LT catalogers have combed the various available sources, but have yet to identify the books in my library written by the following authors: William Shenstone, John Gay, Tobias Smollett, Ambrose Phillips, George Herbert, Oliver Goldsmith, Philippus Paracelsus, Edward FitzGerald, Raymond Lully, Ovid, and Sir Walter Raleigh. Can you cite a source or two? "And you, my midnight darlings, my folios, must I part with the intense delight of having you (huge armfuls) in my embrace; must knowledge come to me, if it come at all, by some awkward experiment of intuition, and no longer by this familiar process of reading? Mr. Fields says: "Perhaps the most interesting to me of all the private libraries I have ever seen in England, was the small collection of Charles and Mary Lamb, which Edward Moxon, the publisher, unlocked for me when I was first in England, before the books were dispersed, as they never ought to have been. Then and there I lovingly handled his Kit Marlowe, his Drummond of Hawthornden, his Drayton, his Cowley, and his Burton! I remember how Moxon's whole family stood around that 'Life of the Duke of Newcastle by his Duchess,' and told stories of Lamb's enthusiasm over the book, a volume about which he has written: 'No casket is rich enough, no casing sufficiently durable to honor and keep safe such a jewel." Peter Bell: A Lyrical Ballad by W.W.